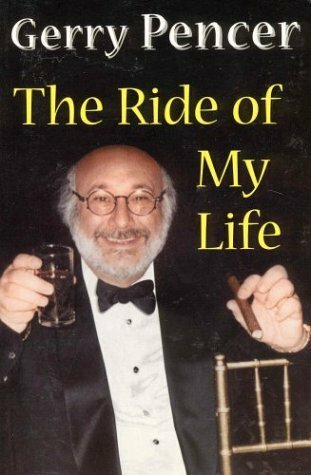 The following are selected excerpts from The Ride of My Life, a memoir written by Gerry Pencer, and published after his death, in 1999. All proceeds from the sale of the book go to The Gerry & Nancy Pencer Brain Trust. “I hear the hum of the drill, but I don’t feel a thing as it enters the left side of my head, just above my ear. I’m lying here, on my back, on the operating table about to undergo a craniotomy to have my malignant brain tumor removed. This is one of the most difficult surgeries there is, and I’m going to be awake through the whole thing, which, you’ve got to believe me, isn’t my idea. I’m lying here thinking about thirty things at once, which is typical. I’m thinking about my family and friends in the waiting room. My beautiful wife, Nancy, and our kids, Stacey, Holly, and Clarke, and Stacey’s husband, David Cynamon, whom I love like a son. My brothers Sam and Bill, and their families are there too. So are Nancy’s mother and her brothers and their wives. I’ve had many lives. My Toronto life, when I turned Cott into a comet. “Our strongest commitment to Gerry’s memory was to fulfill his vision of establishing a Center of Excellence at Toronto’s Princess Margaret Hospital. It was with enormous pride and satisfaction that The Gerry & Nancy Pencer Brain Tumor Centre officially opened its doors to patients and families on November 18, 1998. Gerry’s dream was to raise awareness about brain tumors and to raise funds on behalf of The Centre. Hanging in the conference room are the boxing gloves that Gerry wore to the Cott 1997 annual meeting. They are there to inspire patients in their fight against the disease that has brought them to The Centre. The Centre is dedicated to making a difference in the lives of patients and their families who live everyday with brain tumors. The success of The Center can be measured by the positive impact that it has had on those who have come in for treatment, support, education, or just to take a look around. The Brain Trust and Centre advisory boards include Gerry’s family, his close friends and many of Toronto’s pre-eminent cancer researchers.